Falcon Electrical Installations LTD, as part of their National Testing & Inspection services, carry out PAT test for existing and new clients throughout the UK. Essentially there is UK legislation surrounding the testing of ALL commercial Portable Appliances, after 1 year, to ensure that the product meets the robust safety requirements required for the people who use them. Naturally there is a physical viewing side to any test for elements such as fraying cables, or damaged plugs as well as exposed (non insulated) cables, all of which would be an instant fail. This type of failure accounts for a significant amount of product failures and can be easily remedied in most situations. A Portable Appliance Test (PAT) is required for all electrical products that plug into a socket, Computers, Printers, Photo Copiers, Kettles, Fridges, Christmas Tree lights, but this is not an exhaustive list.Once tested each appliance, assuming that it passes the test, must be labelled with the details of the authorised testing company together with the test date. Who Can Carrying out a PAT test? 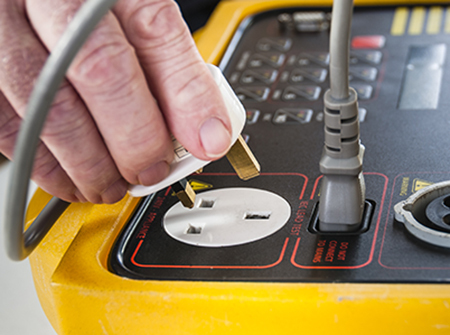 To carry out a PAT test, the tester must be professionally trained and certified, and of course have relevant and up to date testing equipment. Dependent on a variety of factors, PAT test per appliance take about 10 minutes, meaning that a large number of products can be tested on the same day, keeping the cost per test low and competitive. What happens if I miss a PAT test? It is hugely important and a matter of law that all relevant products are tested in accordance with the UK Government (HSE) guidelines. Principally the higher the risk product, EG A mains operated Drill which will encounter site use, impact damage, liquid spills and so on, does require more frequent testing than a printer, which is not moved about, lowering the likelihood of a fault and consequential risk to the user. There is a potential and significant insurance and user risk if you fail to have your electrical products PAT tested and an incident occurs whilst someone is using the item. If in doubt please call for further advise.